NOISE ZONE, platforma pro hlukovou hudbu, bude mít sedmnácté pokračování v klubu Underdogs. Vystoupí skladatel a instrumentalista George Cremaschi s novou skladbou pro electronics, projekt Mooncup Accident performera Jana Klamma (KlangUndKrach) v sólovém podání a Guldur & Opening Performance Orchestra se společným programem fraction & drums. Začátek ve 20.00 hodin, vstup volný. Pořádá re-set production. 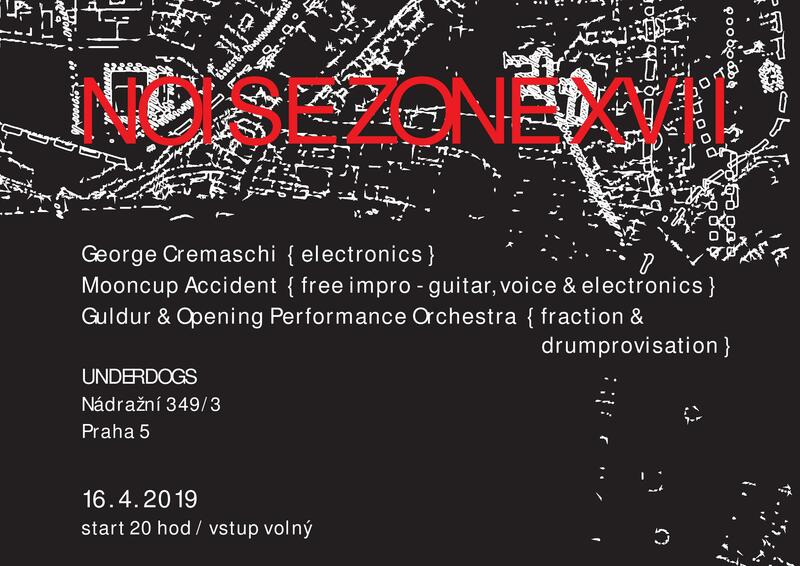 NOISE ZONE, a noise music platform, will organize its seventeenth event in the Underdogs club in Prague. George Cremaschi, a composer and instrumentalist, will perform his new piece for electronics, the project Mooncup Accident by the performer Jan Klamm (KlangUndKrach) will play solo a Guldur & Opening Performance Orchestra will introduce a new cooperation fraction & drums. Start at 8 p.m., admission free. NOISE ZONE is organized by re-set production.